We love the long pendant trend, so we made this Beaded Vertical Bar Necklace. 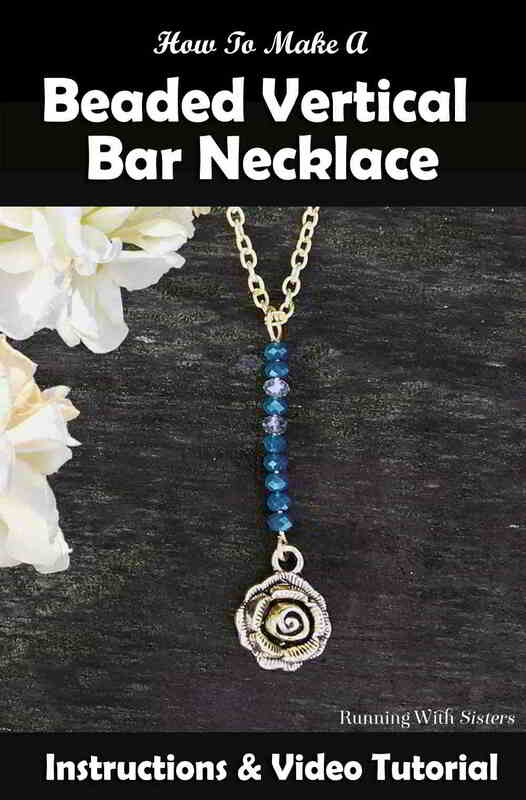 This is a really easy pendant to make. You can make it with any charm on the end. 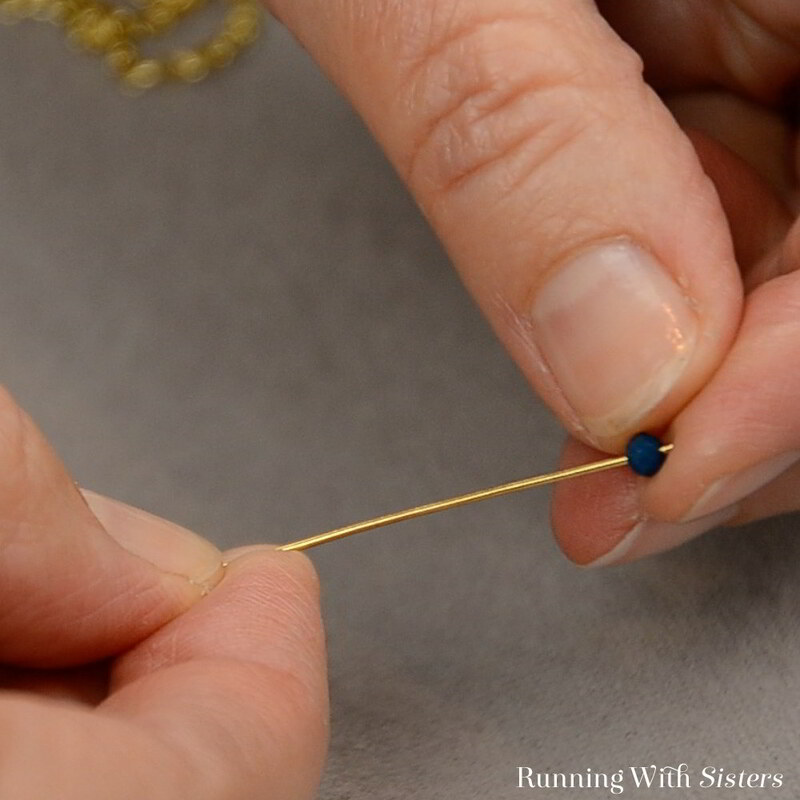 Or you could make it as a simple beaded bar pendant by using a headpin instead of an eyepin. 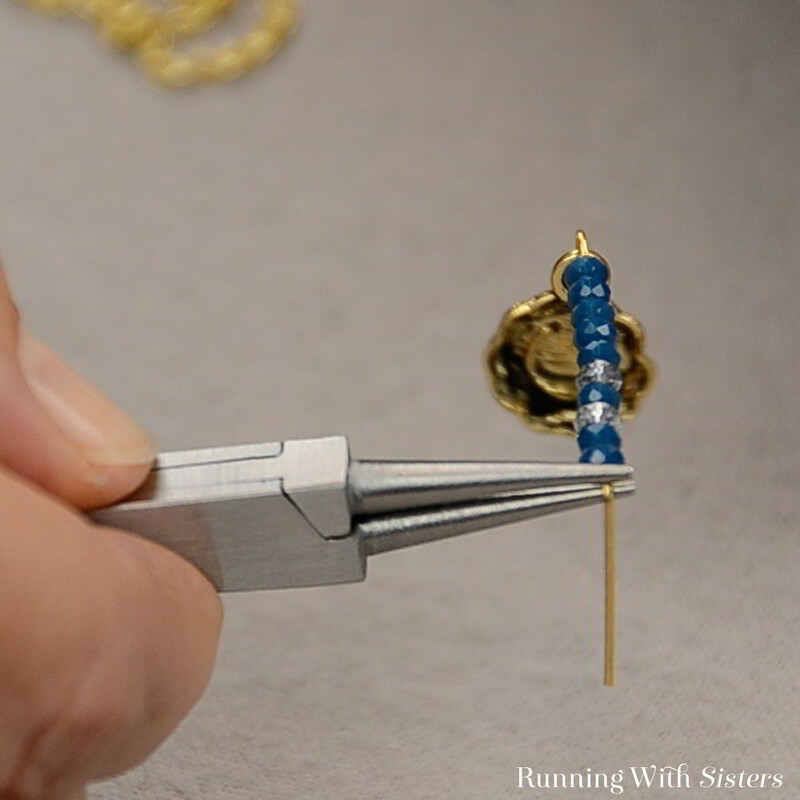 Here’s a video we made to show you every step to make this Vertical Bar Necklace With A Rose Charm. 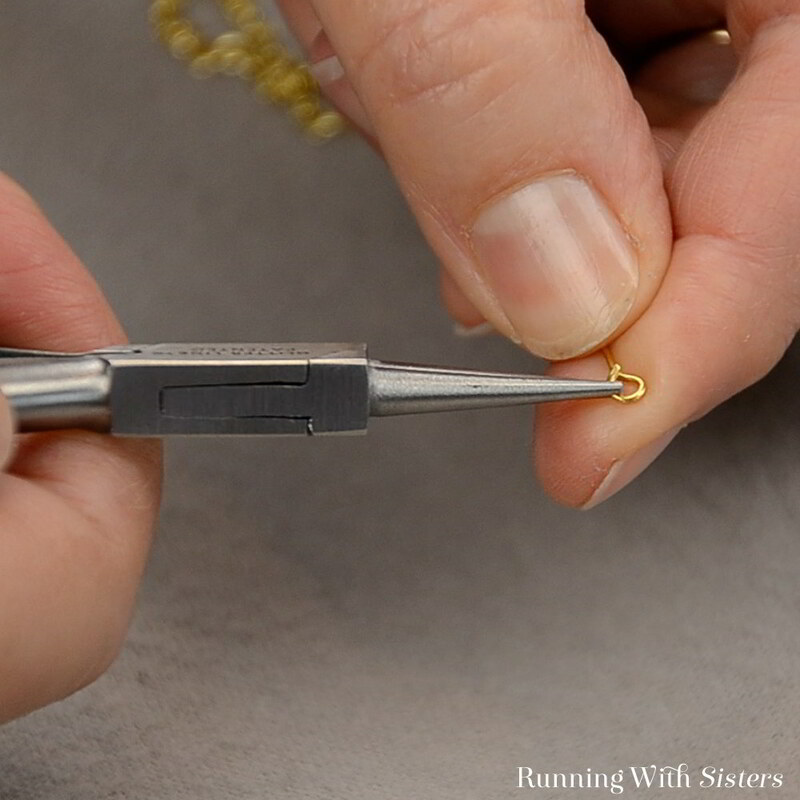 Follow along as we make the beaded bar pendant, then use the steps below to make your own. 1. Open the loop on the eyepin using the round-nose pliers. To do this, grasp the loop and rotate it open so you don’t lose its round shape. 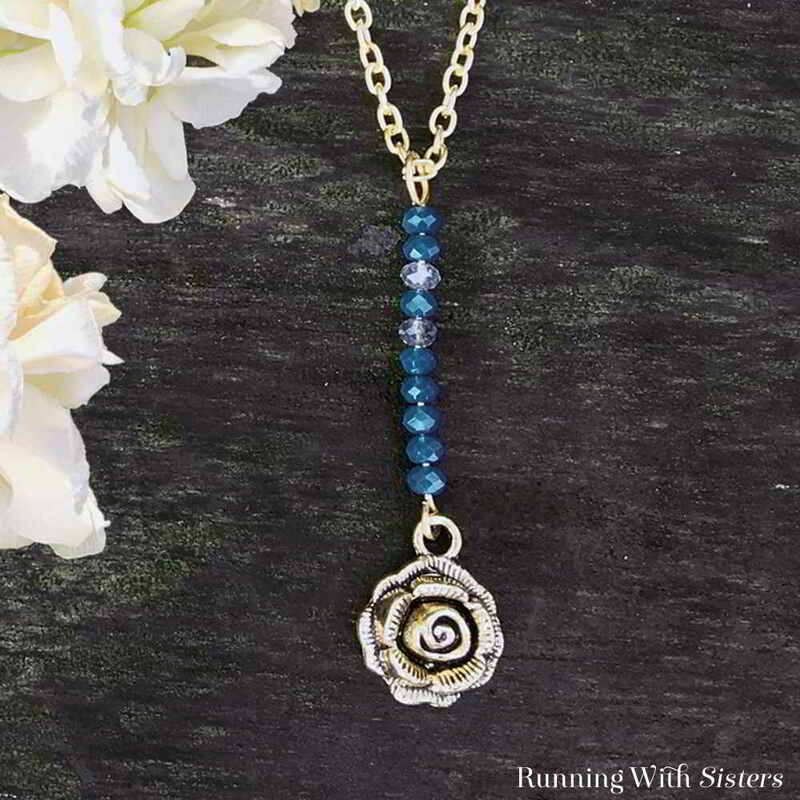 Slide on the rose charm then rotate the loop closed. 2. To bead the vertical bar, slide the beads onto the eyepin in the following order: 5 marine blue beads, 1 light blue bead, 1 marine blue bead, 1 light blue bead, and 2 marine blue beads. 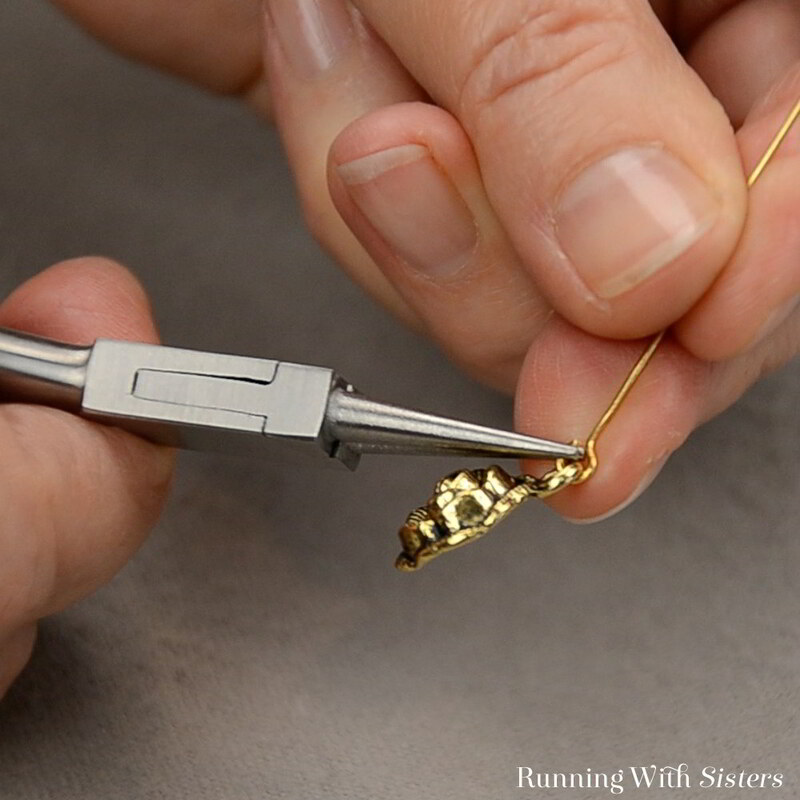 If you wanted to make this pendant without the charm, use a headpin here instead of an eyepin. 3. Finish the end of the eyepin by making a simple loop. 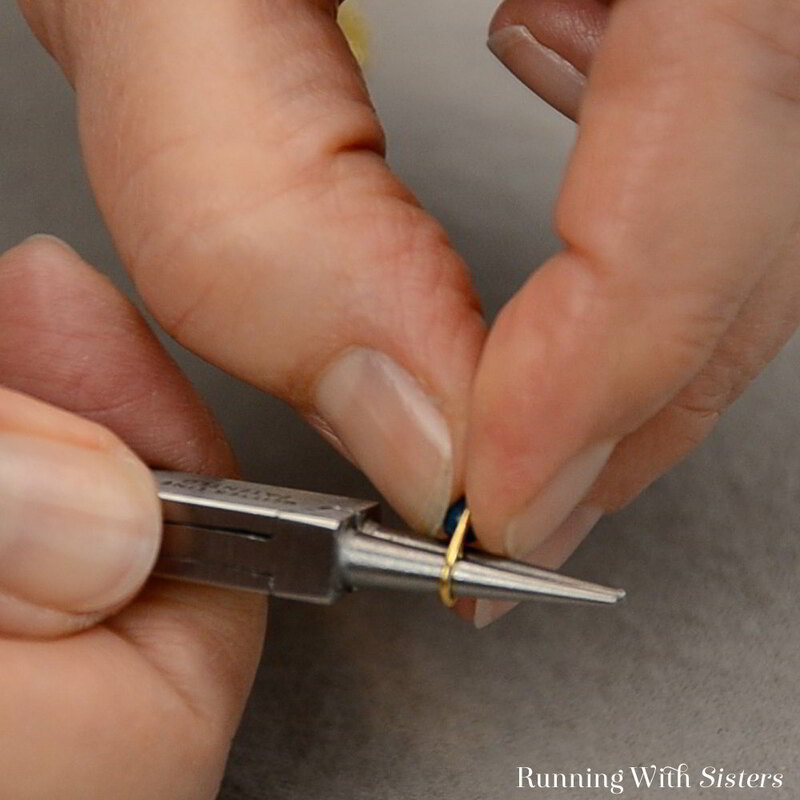 To do this, grasp the wire with the round-nose pliers and make a 90-degree bend in the wire. 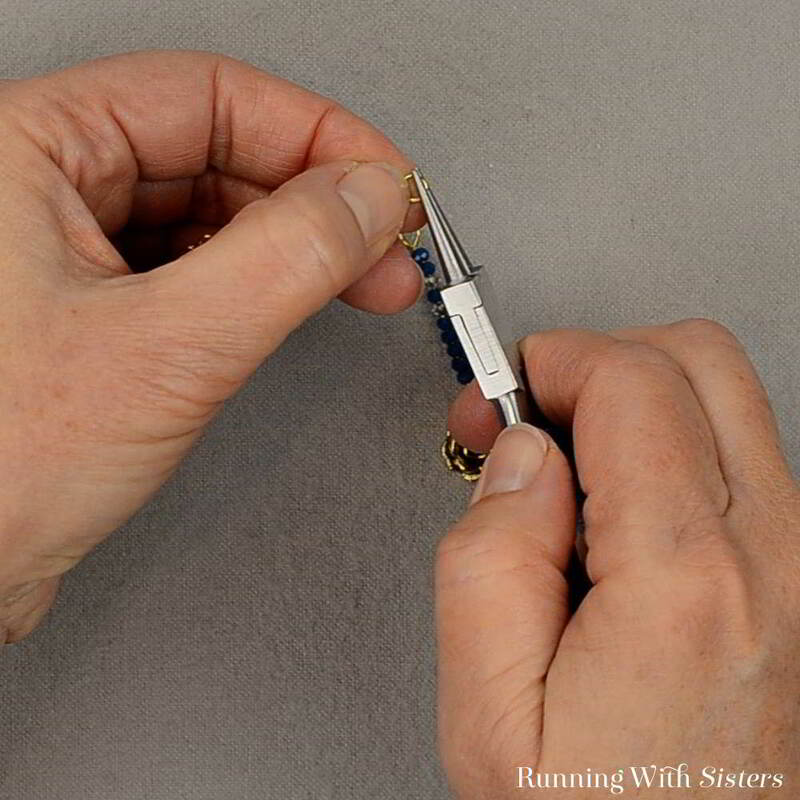 Reposition the pliers to the middle of the pliers (where you grasp and wrap the wire around the pliers will determine the size of the loop, so make the loop big enough to go around the chain). Wrap the wire around the top jaw of the pliers as far as you can. Then reposition the pliers to the bottom jaw of the pliers so you can finish the loop. 4. Adjust the loop with the pliers so the end of the loop matches up and is closed. 5. 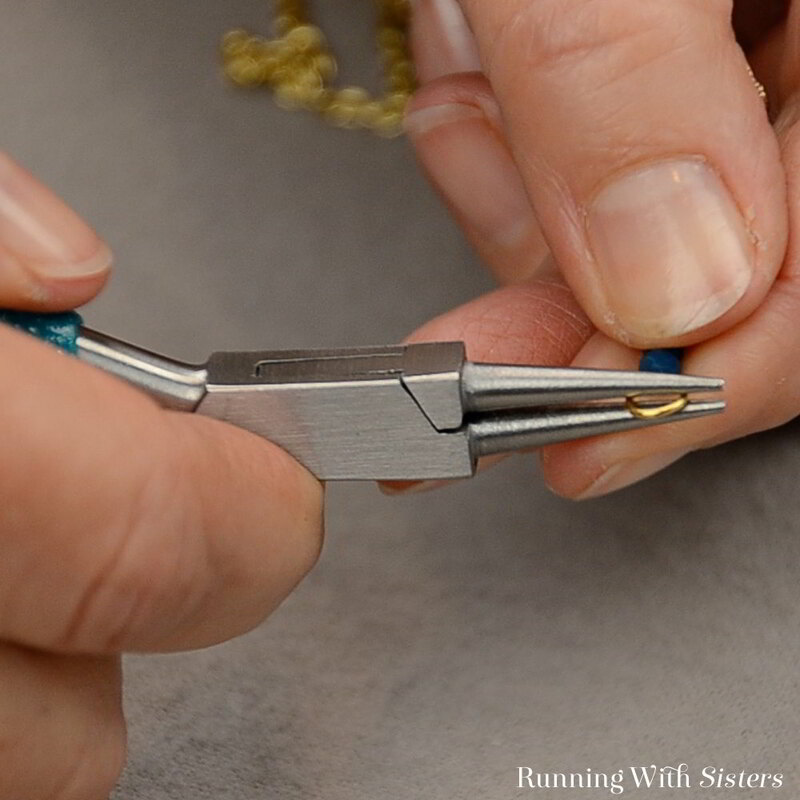 Remove the jump ring from the end of the chain so the chain will fit through the loop on the pendant. 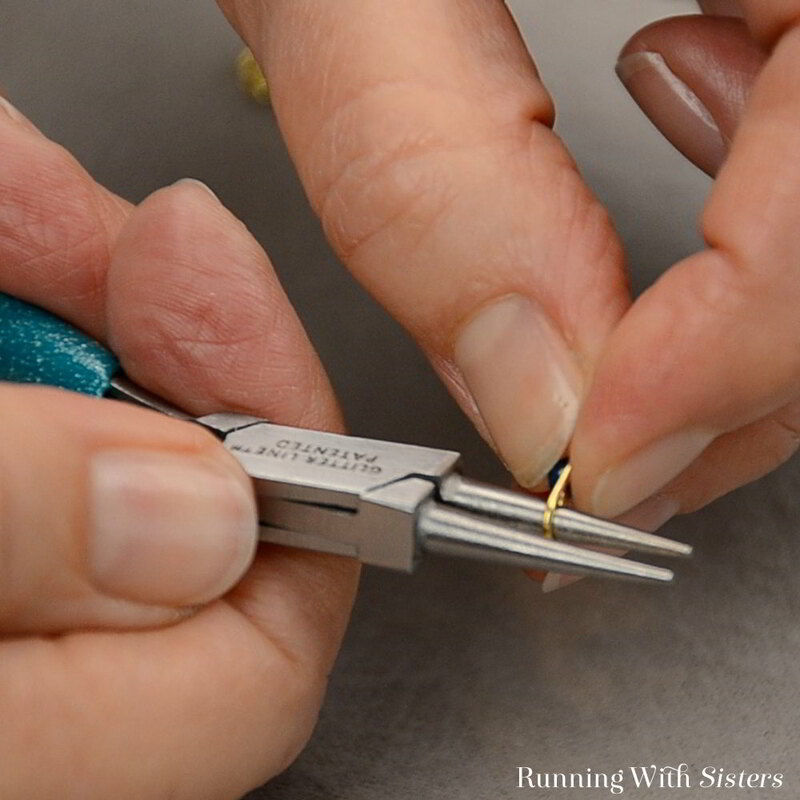 To do this, open the jump ring at the end of chain by rotating it open with the round-nose pliers the same way you opened the loop on the eyepin. 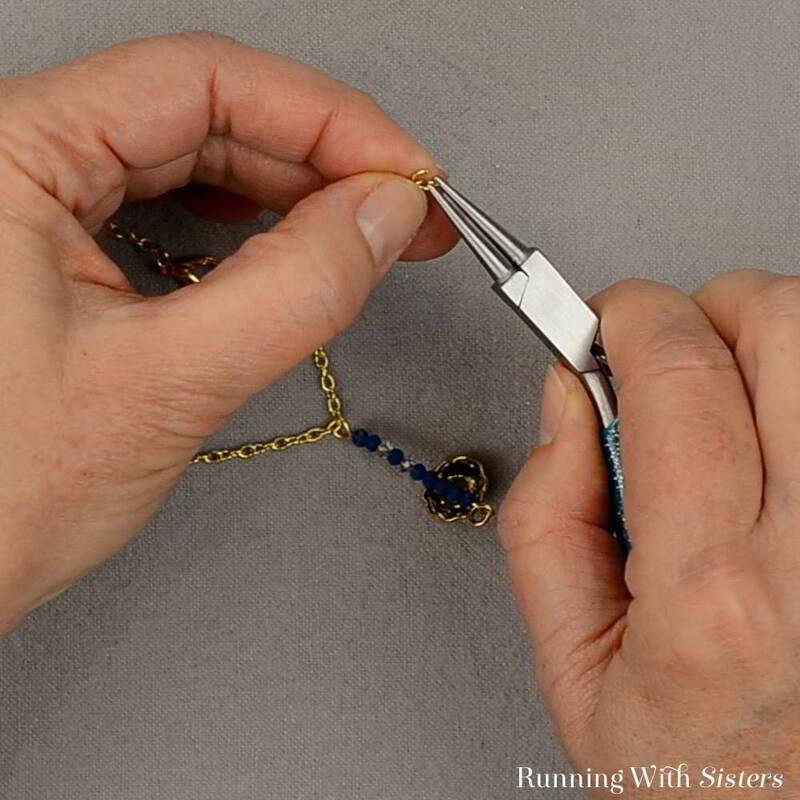 Feed the chain through the loop you just made on the pendant. 6. Feed the jump ring back through the end of the chain and close it. Didn’t this pendant turn out pretty? We think it would look great with black crystals too, maybe on silver instead of gold. Let us know if you make it!